School buses are fairly safe forms of transportation compared to other vehicles. A school bus' size, structure, and design make it one of the best vehicles for passenger protection, according to the National Highway Safety Traffic Administration (NHTSA). Many parents may not realize that, in fact, the biggest school bus safety risks are posed to a grade-schooler when he or she is near a bus, not while riding inside it. Nearly 500 students ages 5 to 18 die each year in passenger vehicle accidents during school travel hours, and almost 100 children in that age group are killed while walking or biking to school each year. In contrast, 4 school-age children are killed each year while riding school buses to and from school, according to NHTSA. Younger grade-schoolers are particularly at risk: At least one-half of those killed in school vehicle-related accidents were between 5 and 7 years old. Younger children tend to act more impulsively, hurrying to get on or off the bus and are less likely to be attuned to traffic dangers. They're also shorter, which means there are two big dangers to their safety: They can't see over cars, hedges, and other obstacles and drivers, in turn, can't see them. To keep kids safe on or near the school bus, teach them the basic rules of school bus safety. 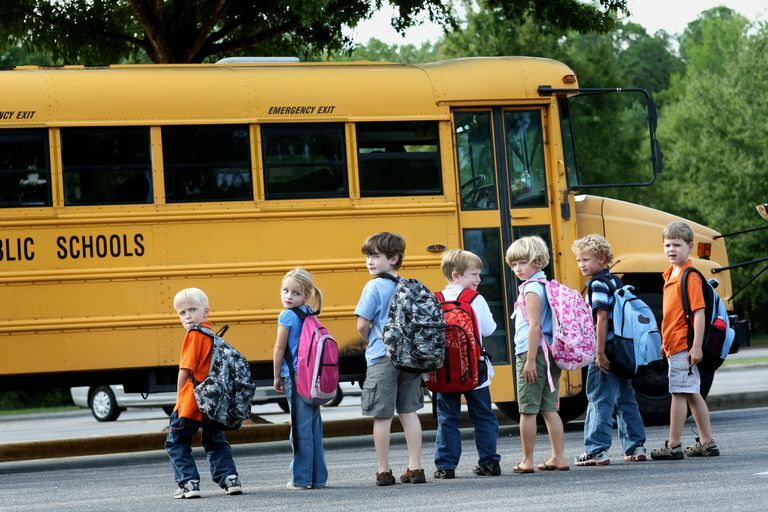 Go over bus safety rules several times with your child and practice them throughout the school year. Walk your child to and from the school bus stop. Most experts note that children under 10 are generally not able to handle unexpected dangers. Until they are in middle school and are able to walk to school by themselves, it's a good idea to have an adult at the school bus stop when your child gets on or off the school bus. When your child is waiting at the school bus stop to get on the bus, have him step away from the curb (about three big steps back) when the school bus approaches. Then he can step forward after the bus stops completely and the school bus driver opens the doors. Remind her to never stick her arms or legs or any other part of her body out the window while riding on the school bus. If he has to cross the street in front of the school bus, have him walk at least 10 feet (about the length of five big, exaggerated steps) away from the front of the bus and make sure the school bus driver sees him and waves her forward before crossing. Remind him to never go near the school bus without an adult who's there to watch him get on or off the bus, and to especially remember to never get close to the wheels of the bus. Teaching your child these important school bus safety rules is an important part of keeping him healthy and safe during the school year, and anytime he is around motor vehicles.